Looking for a dinner that will impress friends/ family it is here. Their pies are delicious and filled with lots of meat and veggies. Their fruit pies are. Delicious as well! Got to try the steak and guinness pie, the tortiere. FIRST CLASS! I will pick up meat pies every time I pass this store. I cannot believe how different they are from the store bought stuff. Really home-made, very well filled pies. Such super value! MUST TRY! 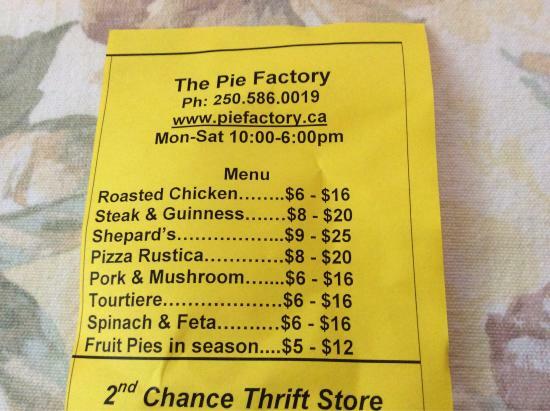 So Happy we found "The Pie Factory " in the BC Canadian Geographic. Wonderful place. Super pies, Mango-Peach with vanilla ice cream, then another day Shepard's Pie. Just fantastic. Great staff. Scrumptious Pies and then some! Get quick answers from The Pie Factory staff and past visitors.